When I began to construct this blog as a farewell to a Houston area watering hole, I thought it would be relatively straight forward. Local bar is founded in the suburbs. 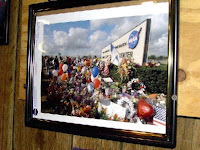 Has a rich and unique history and list of patrons because of its location near NASA. There's no other place like it in the United States, but as times change, time seemed to move on and it didn't, and as a result its relevance is diminished and even as a patron, it seems to be for the best that it moves into our memories vs. our present. But the picture is now murky, I'll expand later. Let's start with the introduction and background. 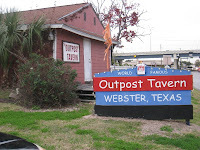 In 1981, on the heels of the Apollo program and as the Space Shuttle program was just beginning, The Outpost Tavern opened in Webster, Texas, at the corner of NASA Rd. 1 (no, there's not a NASA Rd. 2) and Egret Bay Blvd. This is just a stone's throw from the Johnson Space Center in Clear Lake, NASA one of the pillars of Houston culture since the Mercury days. Outpost was founded less than a decade after the last moon landing (about the same time from now back to 9/11 to put it in temporal perspective). 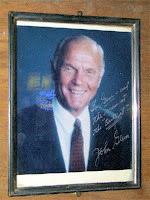 But the area was invigorated with the new prospect of a Space Shuttle Program launching and a new era of space flight. In 1981, the JSC area only had a few neighborhoods, and very little social options, and The Outpost was a local watering hole that was unmatched outside of the Bonanza Steak House and Monterrey House Mexican Restaurant. 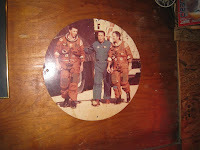 What The Outpost turned out to be a historical local bar, which astronauts, JSC management, engineers, and non-NASA locals frequented for decades. 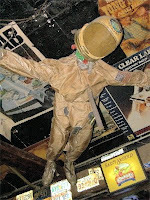 It became primarily known as the "hangout of astronauts". Touchdown parties were booked for every flight. 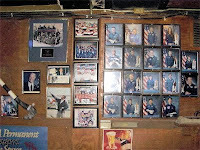 When I was a co-op student working at JSC in the mid-1990's, several crew appreciation parties were held there (nothing like comped beer at 21 years old, shooting the breeze with astronauts). 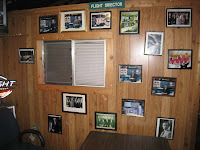 It was a place where "plain old" engineers were invited to mix with the crew and flight operations personnel to share in the celebration of a successful mission. It had all the makings of a neighborhood bar. Memorabilia everywhere the eye could see, wood siding and primitive chairs and tables, a simple bar with a handful of taps, parking on pebbles or grass. For 28 years, locals shuffled in, day after day, to grab a little beer, some basic food made by the two or three staff while you waited, and share stories of design reviews, EVA excursions, and successful touchdowns. It was rumored that if you were selected to serve in the Astronaut corps, you opened a tab at The Outpost to kick off your journey, and didn't get to close it until you returned from your first mission. In the meantime, those "in the know" would run it up as an initiation rite. Good stuff. So why would a place like this close? Well, the area outgrew it. There are more than a dozen other local bars, some chains, some independent, that far exceed it in accommodations, tap options, location, and "buzz". Slowly but surely, it no longer was "the place" to celebrate a successful mission, there were several other options that were easier to get to, had better parking, and more than two people cooking food. It's not to say they were more convenient or had better prices, they just slowly sucked the regular traffic away, and The Outpost slowly faded into irrelevance. That's not to say if you stopped by you wouldn't have good time. It just wasn't the good time anymore. 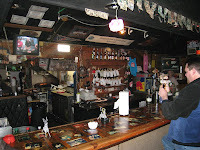 It might have been given up for dead in 2005, when in January it suffered a devestating fire that gutted the establishment. But through extreme vigilance by local fire departments, lots of services provided at cost by local contractors, and patron donations, the place opened within a week, a little bit worse for the wear, but back serving the community. Flash forward to the present. As it turns out, during it's near 30 year run in the Bay Area, The Outpost never owned the land it resided on, nor was it an issue. Until 2009. When the property was sold to a developer. Unfamiliar with the new owners, The Outpost declared that they'd just go ahead and close, instead of waiting for the other shoe to fall and get a vacate notice. To be honest, it seemed a bit quick, as there was no indication that negotiations or intent were discussed with the new owners. But I would also respect that if the ownership after 30 years thought it was time. The Outpost time had past, they no longer wanted to endure the uncertainty, nor the economic downturn, or the prospect of selling it to someone who might turn it into a Chili's clone, and just use the name as a token for profit. But this week, things took a very unexpected turn. In a bizarre twist of cultural respect and information release, it seems as if the new property owners have locked out the management, claimed no rent has been paid for two years, but vowed that they intent is to move the establishment to a very close location and "upgrade the place to make it more family oriented" (hopefully not another Chili's). The physical structure (which was obviously compromised and rebuilt in 2005, we're not talking about that much original here) was a WWII "quonset hut" (see above link) that could quite frankly be moved. Both side vow court action, which I know means lawyers will win (sorry Mr. Smokeypants). The original owners don't want The Outpost name to be used in vain, the new property owners seem to think they have rights to the structures on the property. So we sit in flux. I'm not sure The Outpost has relevance anymore. However, when it was going to be closed, the calls for "national landmark" and "fundraising effort" resonated deep in the JSC community. But I personally think, "all good things must come to an end" and this was a prime example. What happens next, remains to be seen. But a toast to a place not like any other!